LR: Maria Cifuentes, Linda Cifuentes, MPH SEAHEC Community Capacity Building Coordinator, Josefina Salazar, Lauren Acosta NP, SEAHEC CHW trainer, Vanessa Valenzuela Castillo, Jesus Garcia, Aida Dominguez and CPR trainer Jeffrey Osterhoudt. Photo courtesy of Linda Cifuentes. SEAHEC’s Healthy Farms community health worker (CHW) team earned their CPR certification in September, 2018. The CHWs or promotores took the full CPR training with practice on dummies. They all passed the exam at the end of the course and received their certification. “It was a successful training!” reported SEAHEC Community Capacity Building Coordinator, Linda Cifuentes. She and Lauren Acosta NP, a Northern Arizona University faculty member, organized the training. 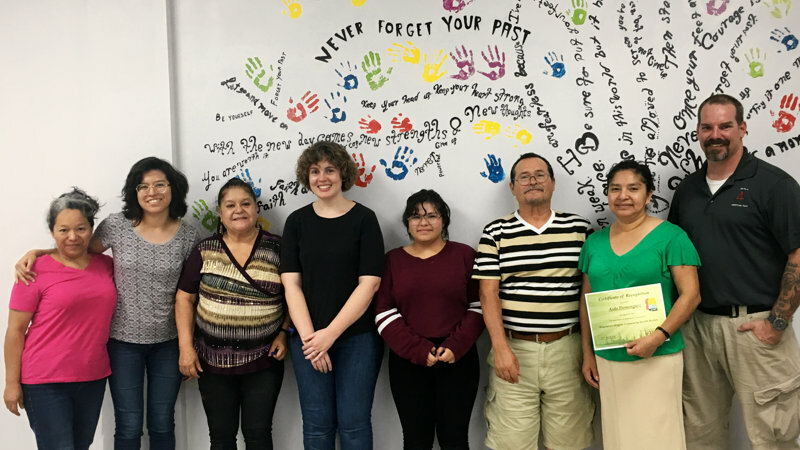 Team members who took the training included Josefina Salazar, Yazaida Esquilin, Vanessa Valenzuela Castillo, Jesus Garcia, and Aida Dominguez. The training was conducted in Spanish by Jeffrey Osterhoudt, of Delta4 Medical. Mr. Osterhoudt is certified by the American Heart Association to teach CPR, and is a former Special Forces Medic. “Winchester Heights has the beginnings of pool of healthcare providers to help provide medical treatment in the 20 minutes or so it’ll take to respond by ambulance,” Mr. Osterhoudt commented on his Facebook Page.